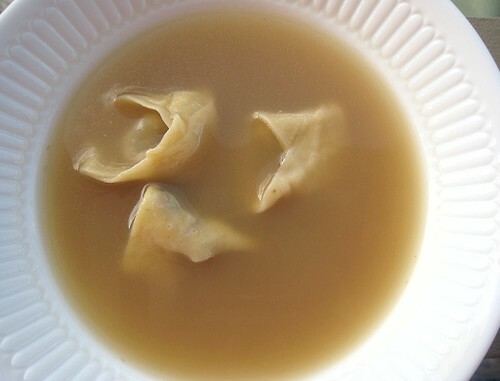 To finish off this single ducky, we bring you Duck Tortellini in Brodo. 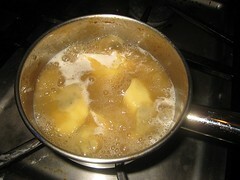 If you remember, we had a roasted breastless and legless carcass and a broth made from it. I shredded all the meat I could for the tortellini filling. I added some pretty duck fat into the pan. In went chopped portobellos until cooked. 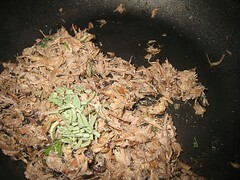 The shredded duck and some sage (from the garden) followed. I let the mixture cool a little, then added egg and grated Parmiggiano-Reggiano. I rolled out and cut some fresh pasta (homemade, of course) and proceeded to fill them. 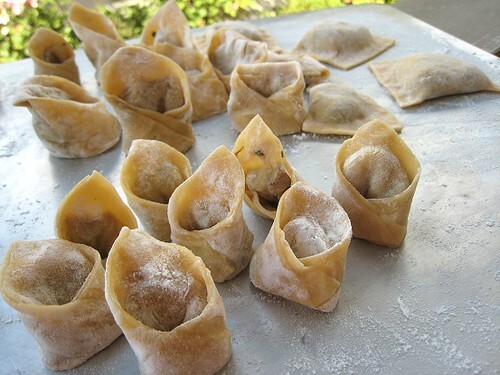 As you can see below, it took a number of trials (those outcasts or uglier cousins at the back) before I sort of got the hang of making tortellini. The eight "pretty" ones still weren't that great, but good enough for me. All this while, I've been infusing the duck broth with a red onion (we didn't have any other on hand, surprisingly) and some celery. No carrots; we didn't have any. I strained the broth and used it to cook the tortellini. That comment about the wontons. . . well, it is just strange that duck has such a "Chinese" taste for me. 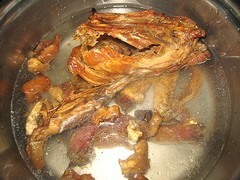 The meat itself, when cooked to well-done, has that "Chinese" signature. Yes, even duck confit from a French restaurant tastes "Chinese" to me -- that is, the taste is comforting and familiar. 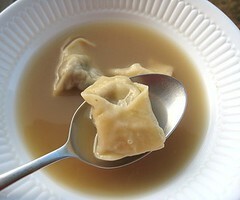 In this case, the tortellini in brodo tasted like a Chinese soup to me. Which is not to say it was bad. In fact, it was quite delicious, in that very comforting, duck-soup-for-the-soul kind of way. I could have added rice to the soup and it would not have been out of place. Absolutely wonderful! 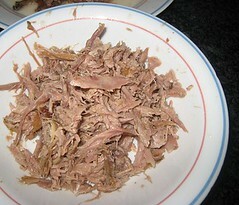 I have been thinking about duck of late especially giving my hand at duck confit. This is on my must make list. whoa!!!! 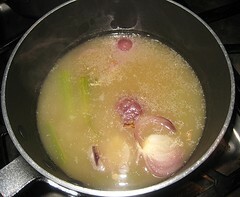 this was one on our list to make this winter - like a real "en brodo" with true broth! LOVE the twist using duck. so elegant. 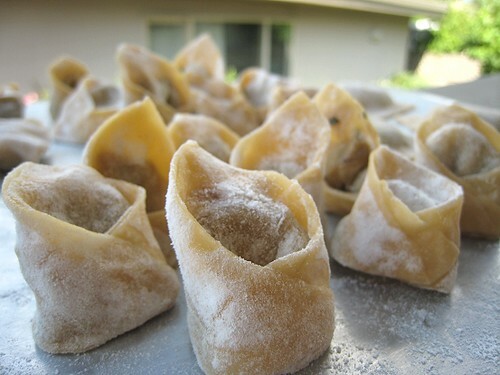 beautiful shaped tortellini. this looks awesome. wow, does that look beautiful. I have a sore throat right now & want a big bowl of it! Great job! Duck, portobellos, sage, pasta, delicious! This looks really delicious. You two really are the queens of duck! Hi TS - Wonderful as usual! You seem to have an indefatigable supply of duck fat at your disposal. This just look unbelievably delicious!! Love duck! My father, who LOVES duck, would absolutely love this meal. I may have to make it for him next time he comes to visit. Oh, I can just imagine how this must have tasted. Fabulous!! Now that is an awesome use for duck! I could practically smell the sage, portobellos, and duck meat sizzling away in that duck fat. 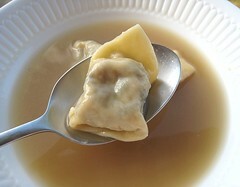 That is such a pretty tortelini! You are really making use of that duck. I'm sure this was really fragrant! You guys made the most of that duck, I don't know anyone who could've done better. This made me remember my past life in Italy! Yummmmy! Nice job on the tortellini. They are super cute. Did I tell you I love duck? 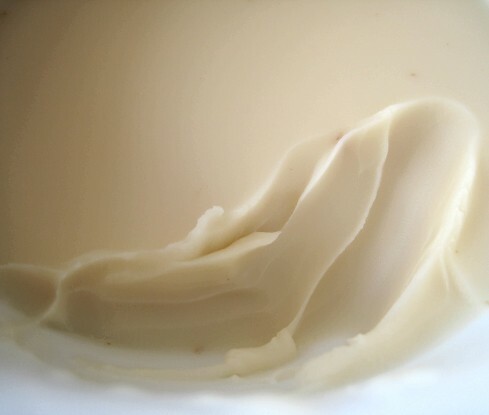 I could never tire of duck fat photos. I saw this on Martha the other week. I am glad to see someone made it. It looked very intriguing. Yours look great! 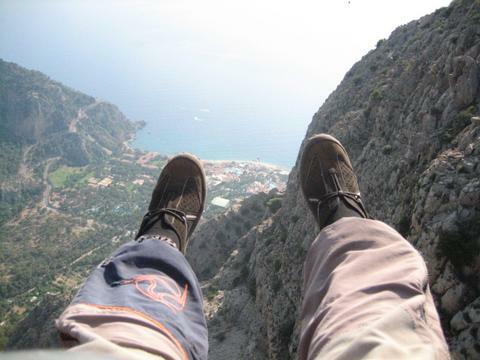 Firstly: This looks incredible. 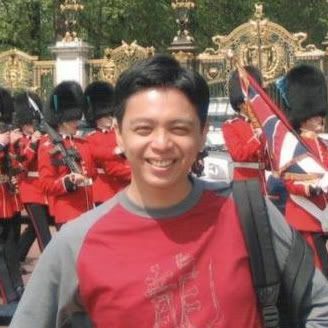 I just want to eat your picture. 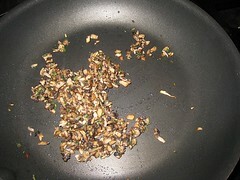 Secondly: it is so good for you to maximize your yield on duck. Duck is expensive and you did a stellar job in using it in a multitude of ways. Oh my. Well aren't you two fabulous? These look so amazing. I'm a total whore for duck. What a send-off. I can't think of a better way. Wow. Good job. Very impressive dish. I also like the $5 duck series. Thank you for participating in this week's Presto Pasta Night! Yum! 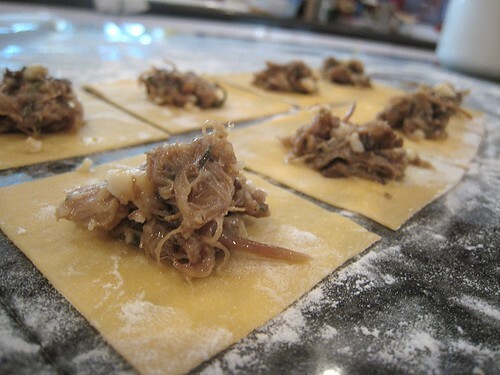 If I hadn't committed to using rabbit, I was going to use duck confit for my ravioli last week. These are really beautiful. 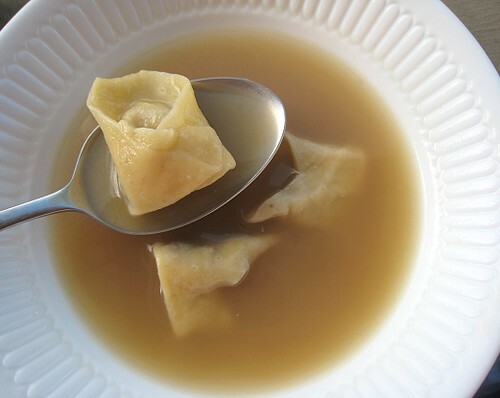 I love love love pasta "en brodo"! Wow, you really did marvelous work on this post. The photos are beautiful and I'm super-impressed by your homemade tortellini. Sitting here on the other side of the screen, I can only imagine how good it was! We would love to see yours! Haha... well-done duck meat will always be Chinese-y for us. Yes! There's nothing like that duck aroma. We're looking forward to seeing it! Once at a food festival I had duck ravioli in an orange sauce which was divine, speaking of which, this looks spectacular too! It was a really good buy, that duck.